Over the past two years, Career Services has helped nearly 600 students develop their natural talents using the CliftonStrengths assessment. Through group workshops, individual advising appointments, and leadership development training, students have been able to identify what they do best and recognize ways to apply their strengths at school, work, and in their personal lives. The impact of knowing and applying one’s strengths are significant. In addition to the personal benefits outlined in the picture above, Gallup found that people who know and use their strengths are six times more likely to be engaged in their work and three times more likely to report an “excellent” quality of life. Typically, self development starts with identifying weaknesses and trying to improve upon those. It’s easy to name areas of weakness. It’s much harder to name personal strengths. But, by identifying areas of natural talent, and developing that talent, people can grow exponentially faster than they would by trying to improve upon weaknesses. In other words, improving weaknesses may lead a person to be decent at many things, but improving strengths will make a person stand out. 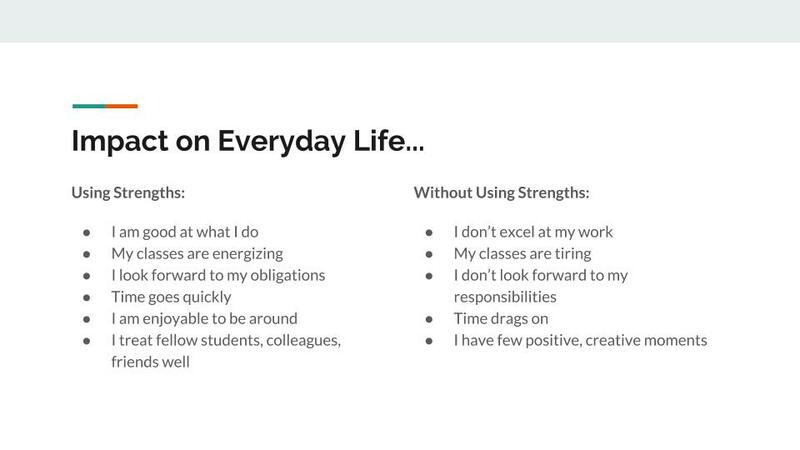 The CliftonStrengths assessment identifies one’s top 5 strengths and suggests ways to apply them on a daily basis, which leads to greater satisfaction, engagement, and productivity. Follow along here for the next nine weeks for a glimpse into the 34 talent themes that make up the CliftonStrengths assessment. To complete the CliftonStrengths for Students assessment, or to request a group workshop, contact strengths@iit.edu.